With those written words, the great Frederick Douglass laid down his pen. Through the 77 years of his life, he had been a slave, a runaway, a world-renown orator, a best-selling author, an adviser to presidents, a candidate for national office, a US Marshall, and an advocate to both men and women, particularly being a key advocate for the right for women to vote. Life had been hard for Frederick, but he was put on this Earth to make life a little less hard for everyone else, no matter who they were or where they came from. Born into slavery on Maryland’s eastern shore in 1818, Frederick Augustus Washington Bailey (the name given to him by his mother) was the offspring of a slave mother and a white man, thought to be his mother’s master. Early in his life, his mother was “rented” to another farm in the north, leaving young Fred to be raised by his grandmother. His grandmother Betsy, while a slave herself, was married to a free man. There was a significant free African-American population on the eastern shore and it exposed Frederick to the idea that you didn’t have to be tied to your born lot in life. Around 1825, he was sent to the Wye House (he wasn’t sold, he moved to a different property of the same owners), separating him from his grandmother. Life got even tougher Frederick, as he bore witness to, and endured himself, beatings and starvation. His master, Aaron Anthony, was particularly cruel. Fortunately, the women of the Anthony and Auld (Anthony’s son-in-law’s family) households saw great potential in Frederick. Along with their own similarly aged sons, they taught Frederick how to read and write. When the men of the house learned of this, they immediately put a stop to it. It was against the law, not to mention the social code of the day, to allow a slave to become literate. Undeterred, Frederick continued to teach himself, knowing that an education was the key to a life of freedom. Over the next ten years, Frederick would also often be caught teaching other slaves how to read. He would be punished, but that did nothing to stop him. After an escape plot was foiled, Frederick was sent to a reputed “slave breaker.” But he could not be broken. While working in Baltimore, he met a free black woman named Anne Murray. They fell in love. He had tried escaping twice before and failed, with severe consequences. The third time was a charm for him. In 1838, disguised as a sailor, and with identification papers from a real free black sailor, he endured a harrowing, but short, 24 hour journey that ended in the home of abolitionist David Ruggles in New York. Now a free man, Frederick Bailey married Anne Murray (they remained married for 44 years until her death) and changed his surname initially to “Johnson”, but then later to “Douglass”, after reading Sir Walter Scott’s The Lady of the Lake, which features the “Douglas” clan. In New York, his personal narrative and incredible intelligence became his ticket to being one of the most sought after abolitionist orators of the day. Rochester, the western New York town in which the Douglass family settled, was the perfect place for Frederick Douglass to call home. It was a hotbed of progressive activity and ideas. Besides Douglass and his now-friend Garrison, the women’s suffrage advocate Susan B. Anthony; escaped-slave and caretaker of the Underground railroad Harriet Tubman; and New York governor and well-known abolitionist (later, Lincoln’s Secretary of State) William Seward all called Rochester home during their lives. 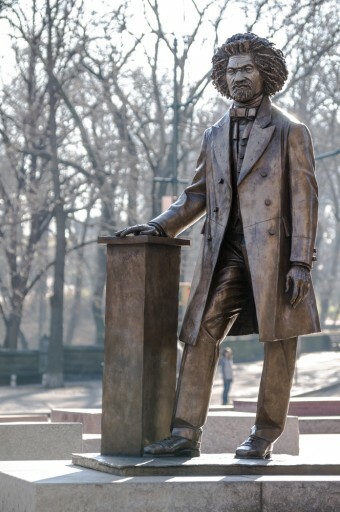 His social conscience and the environment around him encouraged Douglass to take on other causes. Douglass was one of the few men to attend the first Women’s Rights Convention in Seneca Falls (about 50 miles from Rochester) in 1848, and played a key role in swaying the opinion at those meetings that women should be given the right to vote (many of the women at the convention, including one of those who organized it, thought that was a ridiculous notion). He spoke out against the way the Native Americans were being treated. He campaigned on behalf of all Union soldiers to be paid equally- no matter race, social status, or what state they were from. In April of 1861, with the attack on Fort Sumter, the Civil War commenced. Douglass believed that African-Americans had a responsibility to take part in the war and a right to be able to. Fortunately, the Commander-in-Chief of the Union army, President Abraham Lincoln, agreed with him. Frederick Douglass became Lincoln’s connection to the African-American community and he invited him to the White House on several occasions. They would discuss ensuring the equal pay and treatment of African-American soldiers, the link between preserving the Union and the abolition of slavery, and granting escaped slaves asylum. Following his reelection, Lincoln invited Douglass to a White House reception. It was the first time a black man was invited to a reception of that nature. Though high in position, the humblest could approach him and feel at home in his presence. Though deep, he was transparent; though strong, he was gentle; though decided and pronounced in his convictions, he was tolerant towards those who differed from him, and patient under reproaches. Even those who only knew him through his public utterance obtained a tolerably clear idea of his character and personality. The image of the man went out with his words, and those who read them knew him. On February 20th, 1895, at the age of 77, Frederick Douglass passed away in Washington DC, hours after giving a speech to the National Council of Women. He was a tremendously admired man for his commitment to his convictions and unwavering advocate to the African-American community. He was welcomed by Presidents, kings, and leaders across the world. Thousands attended his funeral in New York and you can still visit his gravesite today, in the Mount Hope Cemetery in Rochester. After the publishing of his first book, “Narrative of the Life of Frederick Douglass, an American Slave,” he became a prominent and well-known figure. For this reason, he traveled to Europe to not only promote his book, but to avoid the potential consequences of being an escaped slave in the United States where a lot of people now knew where he was. Technically, Douglass was still-owned and had a master. He feared that he would be hunted down. Eventually, he would return and British admirers of his raised the necessary funds to buy his freedom. It is thought that the British government wanted to intervene in the American Civil War on the side of the Confederacy. Not because they supported slavery (it had previously been outlawed in Britain), but because of lack of export of cotton from the Americas was hurting the cloth industry in Britain tremendously. They never did provide any significant aid to the South due to what some say was the overwhelming sentiment against slavery that Frederick Douglass helped provoke in the British people during his time there about 16 years before the Civil War started. This public sentiment, combined with the 1863 master stroke that was the Emancipation Proclamation, officially making the war about slavery, made it impossible for the British government to come to the aid of the South in exchange for favorable deals on cotton exports. Very interesting. I wonder what happened to his mother and grandmother? Were they ever freed? I believe his name is spelled Douglass. He wanted to take the Douglas name, but make it his own separate identity – thus the additional S at the end. @Mike: Yep, thanks for catching that. Fixed!